A beautiful annotated games collection - featuring one hundred games from the twentieth century - presented chronologically with one game per year. Indexed by opening name, player name and ECO code. This unique collection of games – one from each year of the twentieth century – is more than a look back at the games themselves. 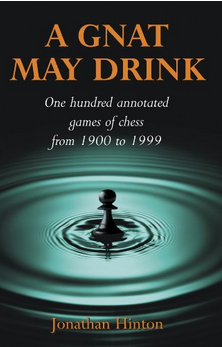 It is a welcome return to the way chess game anthologies were lovingly crafted in the middle years of the century. There is no bewildering morass of variations, as in all too many 21st century works. 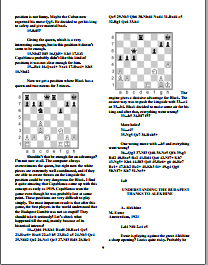 It is as readable as it is well-written, with verbal descriptions which enhance the aesthetic quality of the games, penned by a true enthusiast with insight into the prevailing chess culture as well as the ideas behind the moves. The reason the number of pages is 944 is that this was made from a DIGITAL version of the book (eg. 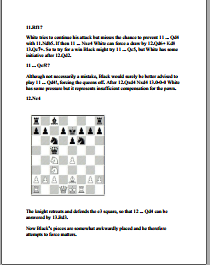 from Amazon Kindle, Forward Chess etc) - not scanned from a real paperback book. So the layout is single column not double column like you get in a traditional book layout. For this reason the number of pages is almost double the paper version. 2) You then manually scan all 440 pages one at a time and afterwards convert the images to PDF (this is actually how non-digital versions of books get shared online - there is a huge amount of manual work before they are shared...they do not just appear by magic). 3) Then you share it here as a generous gift to the forum. Looking forward to your 440 page version. Thank you very much for the book ...There is also software that can do that: eg PDF-XChange Editor. (I use it if I want to print out something). Another good software is Anicesoft Epub convertor. I have noticed that when people use Calibre, the original formatting is gone. With Anicesoft you retain the formatting in both epub as well pdf conversions, almost as if you are reading it in kindle. Gambitman, thank you for taking so much trouble over this. Maybe in future we could setup Group-Buys where many can contribute using even Amazon Gift vouchers and bitcoins. Has anyone here used onedollarscan.com for getting books scanned. If yes, how was the experience ?